To offer our own multivitamin combo, we added Biotics D-Mulsion FORTE to our Basic Multi Pack. This adds 2000 mg. Vitamin D3 per drop. 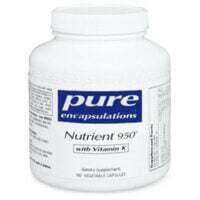 Pure Encapsulations Nutrient 950 with K2 provides therapeutic levels of the best forms of Vitamins and Minerals, including Vitamin K2 and the 5MTHF form of Folate. It does NOT contain Iron as most people do not need it. 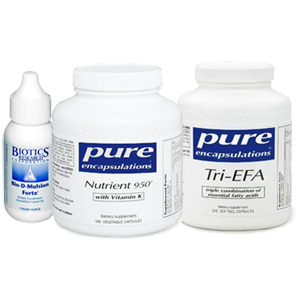 Pure Encapsulations Tri-EFA caps contains 400 mg. each of Borage Seed Oil, Flax Seed Oil and Fish Oil (Anchovies/Sardines). Not pre-packed in individual servings so you can take the dose you prefer. Thank you for choosing to buy directly from my clinic and online store! 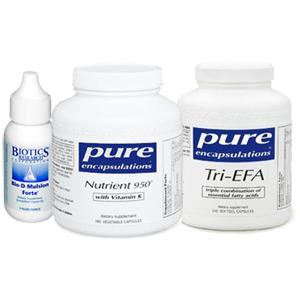 One bottle each of our top selling Pure Encapsulations multi-vitamin, essential fatty acid supplement and emulsified Vitamin D3 sold together in the Basic Multi Pack plus D at 10% off their separate prices. These are professional grade supplements not sold in stores, substantially different from inexpensive national brands. 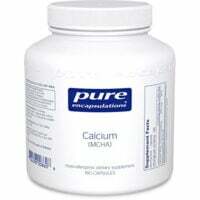 Read more about the Multi here; the Fatty Acid here; and the D-Mulsion FORTE here. Dosage: Dosage is 2 to 6 daily of the Multi and the EFA’s and 1 to 4 drops of the Vitamin D, with food, in divided doses. Pure Nutrient 950 with K is 180 caps. Pure Nutrient Tri-EFA is 120 caps. Vitamin D3 is 1 ounce, enough for several months. Thank you for buying directly from my online store! We’ll pack your products with our very own hands right off the clinic shelves.